Like many others, I have access to a selection of mutual funds through my employer sponsored 403b plan (may be a 401k in your case). Most of these funds involve some degree of active management. Only a few aim to replicate the performance of an index exactly. Hence, this presents an opportunity to test Buffett's hypothesis that over a 10-year period, the S&P 500 fund will outperform the hedgefunds. A total of 37 funds were available thru my employer's 403b plan. Of which, only 23 has been in existence for more than 10 years. 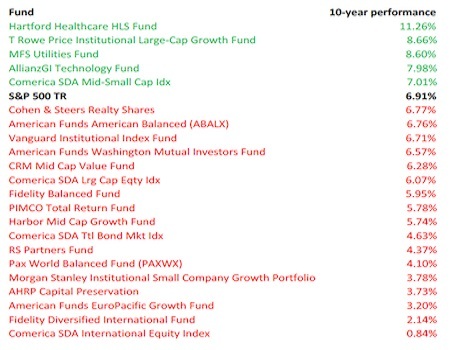 The annualized 10-year performance data as reported by Lipper was reviewed and funds ranked based on their returns. As you can see above, of the 23 funds available through my 403b plan with a track record longer than 10 years, 5 (22%) outperformed the S&P 500 Total Returns (TR) fund over the last 10 years. The best performing fund was a healthcare sector fund with annualized return of 11.26% - which should make us feel very comfortable about our chosen career path. A total of 17 (78%) lagged behind the performance of the S&P 500. It's interesting to point out that the Vanguard Institutional Index Fund actually aims to replicate the performance of the S&P 500 but it actually lagged a little behind in actual performance - 6.71% vs. 6.91%. 1.Retrospective analysis - unlike Buffett's prospective bet with Protege Partners. And as we all know - past performance is not a predictor of future returns. 2.Limited sample size - I only had access to 23 funds for the comparison. So this is more fun and anecdotal than say a vigorous scientific study. 3.10 year time frame - 10 years may seem like a long time for a young professional beginning his/her career, but may not be long enough for others who are nearing retirement. Additionally, the last 10 years included one of the steepest recessions and longest booms in American economic history and may not be representative of the typical decade. But then again, I'm not really sure what a typical decade looks like since every one seems so different from the next. Within my limited selection of funds, it would appear Buffett's theory is correct - 78% of funds lagged behind the performance of the dull, boring, mundane S&P 500 index. Or depending on whether you are a glass-half-full kind of person - 22% of funds beat the benchmark. To me, this adds another 17 reasons why I wouldn't bet against Warren Buffett. What about you? 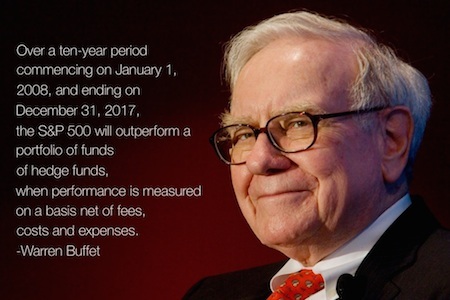 Will you do a similar comparison of funds available to you? Comment below with your results!